On November 15, 1999, Dutch computer scientist Mark Overmars released a piece of software named Animo. It was a graphics tool that featured limited visual scripting capabilities. Within the next few years, the tool was renamed GameMaker to reflect its specific purpose. Before the internet age, creation tools such as Mr. Overmars’s were difficult to get ahold of. You either had to specifically go out and buy them or work for a big-name developer. However, with advent of the internet, people could distribute such software far more easily. Therefore, it was no coincidence that when the internet became commonplace, gaming began cultivating an independent scene. One of the people who utilized Mr. Overmars’s GameMaker program was one Matt Thorson. Going by the e-handle YoMamasMama, he began making games as early as 2002. 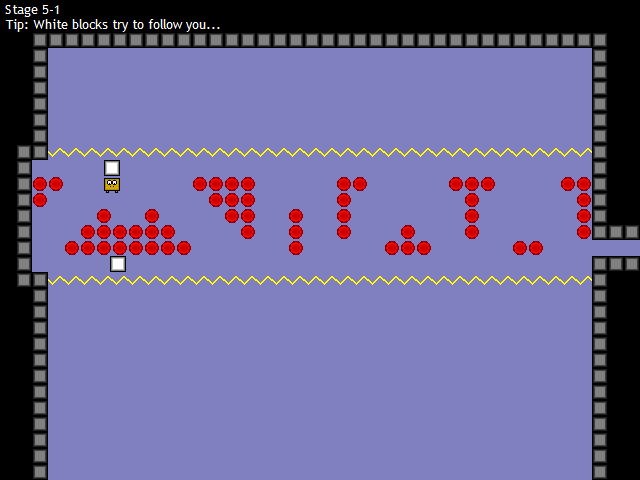 After finishing his first game, The Encryption, in 2003, he moved onto a new project: Jumper. He completed the game in February of 2004 at the age of sixteen. Though not a viral success like Cave Story, which was released in the same year, Jumper managed to find an audience and is considered an admirable freeware title. 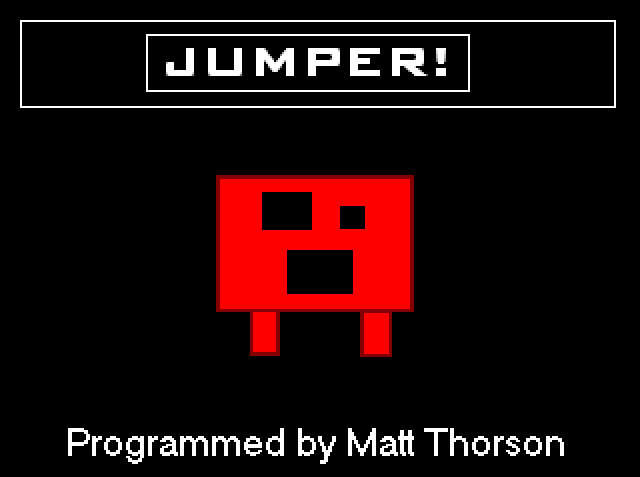 Speaking retrospectively on his website, Mr. Thorson would consider Jumper the first game he was truly satisfied with. Was Jumper a strong debut for a budding indie developer? In the year 1888, scientists began experiments with a simple goal in mind: create the ultimate solider. Those in charge of the experiment named the creation Ogmo. However, the project halted well before it reached completion during the First World War. The laboratory was subsequently abandoned and Ogmo with it. It is now the year 2004, and Ogmo has awakened from his long slumber. With the facility long since fallen into decay, you must help him escape so he may know freedom for the first time in his life. Mr. Thorson describes Jumper as “a minimalization of the platformers [he] loved as a child”, which perfectly and succinctly describes what kind of experience the player is in for. You control Ogmo with the arrow keys. The left and right keys will move Ogmo in that direction. Pressing the up key will cause Ogmo to jump. At first, a newcomer may be wondering why the game is called Jumper if the protagonist’s jump doesn’t gain a lot of height. The answer to such an inquiry would be answered in the next few stages. Like many other video game protagonists, Ogmo has the curious ability to jump a second time in midair. 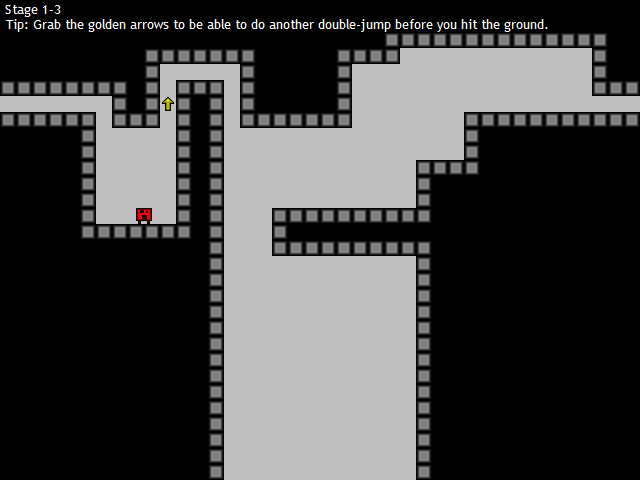 While this by itself is not unusual, Ogmo’s double jumps are supplemented by the yellow arrows scattered throughout the game. If Ogmo passes through them, he regains his ability to jump. This means the number of times the ultimate solider prototype can jump is limited only by the number of arrows he collects before touching the ground. This simple mechanic forms the backbone of the experience. In the purest sense of the term, Jumper is a platforming game. There are no enemies to fight, princesses to save, or any higher goal than escape the laboratory. Where you must go is never a question you will be asking because the answer is always the same. Simply walking off the right edge of the screen will place you in the next stage. Naturally, if all you had to do was jump across various stationary platforms, the game would be a cakewalk. Fortunately for you, though perhaps not so much for the protagonist himself, there is an incredible variety of obstacles for you to dodge. Despite the fact that he was designed to be the ultimate soldier, Ogmo is actually extremely fragile. Only a single touch of a hazardous object is enough to put him out of commission. Filling the hallways of the laboratory are electrical currents, fireballs, spikes, cannons with infinite ammunition, and the horrifying death god who has haunted countless platforming games by living just below the bottom of the screen – including this one. There are no invincibility stars to bail you out of the challenge either; to win you must endure everything the game throws at you. It’s often easier said than done, for getting past these obstacles invariably involves precise midair maneuvering. I liken the process of getting past these hazards to playing a song on the piano; you will struggle to get it right on your first few attempts, but it becomes gradually easier once you begin developing the appropriate muscle memory. There are no checkpoints either, so like how a musician performs a solo without hitting a sour note, you must complete a stage without making a single fatal error. What I particularly admire about the level design is the various props Ogmo can interact with. 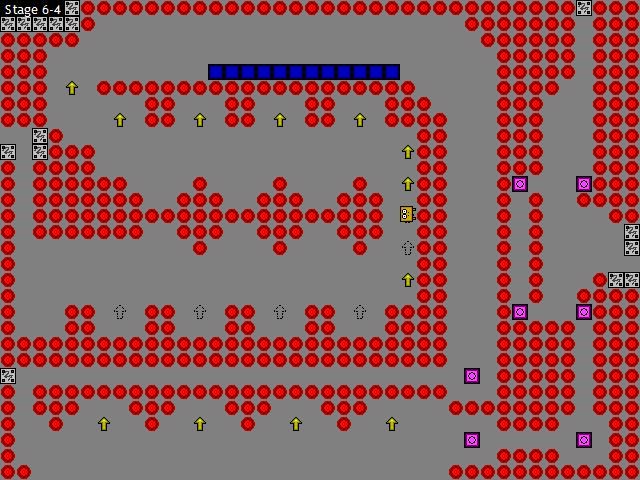 Later in the game, you will have to negotiate white blocks that try to follow him, purple machines capable of launching him in one of four directions, and moving platforms. You will learn early on that despite its harmful appearance, Ogmo can pass through red electricity with no ill effects. If somebody was wondering what the purpose of red electricity is when fireballs serve the same purpose, it’s because the mechanisms in a room behave differently depending on whether or not the power is on. Moving platforms stop in their tracks and certain doors close when you turn off the power. Therefore, while you might remove the threat of being electrocuted by turning off the power, you won’t be able to complete the stage if there is a door in the way. There are also doors that won’t open until Ogmo pushes a crate onto a switch and another remains closed unless he collects all of the stars in the stage. There are two different stars Ogmo can collect. Black ones take away Ogmo’s ability to double jump while their golden counterparts restore it. Due to the latter’s mechanics, they effectively functions as single-use yellow arrows. Even better, in a manner similar to that of classic NES titles such as Excitebike and Wrecking Crew, Jumper comes with a level editor. Through playing around with it, you get a sense of how much thought went into these props. If you’re having trouble using one, it may be worth your time to break open the editor and see how they work. Because you have complete control over where Ogmo spawns on these stages, it’s very easy to test the mechanics. In effect, the editor is just as effective as a training mode as it is a level creation tool. The manner in which the game gradually introduces these set pieces is highly reminiscent of the Mario franchise. What allowed those games to remain enduring platforming classics is that while they were constantly bombarding the player with new mechanics, the lessons you learned from using them are never fully discarded. Everything you learned in the first stage is applicable to the later ones; you’re just using said skills in increasingly complex ways. Along those lines, the gameplay of Jumper is incredibly basic, yet Mr. Thorson managed to explore every facet of it through the challenges the experience provides. While most games have one or two infamous stages everyone has trouble completing, it’s the other way around in Jumper. There are countless difficult stages to be found in this game, and everyone who plays it will have at least one that they find nigh-unbeatable. Here’s an example of how crazy things will get by the end. I think it’s also worth mentioning that although most of them lacking a unifying theme, Mr. Thorson managed to lend quite a bit of personality to each of the sectors. It’s especially impressive given that the biggest difference between them is the monochromatic background color, though I feel this aspect is helped by the soundtrack. The music is composed of MIDI renderings of well-known tunes from other video games, and the choices are astonishingly fitting. Sector 1 uses the theme associated with the Carrington Institute firing range from Perfect Dark while the following one plays the song “Dark Clouds” from the Japanese version of the obscure shoot ‘em up, Bio Metal. The former is a perfect choice for what amounts to an extended tutorial and the latter carries with it an adventurous feeling that lets you know the game has begun in earnest. This also lends an interesting contrast between the final two sectors. Sector 6 has an oppressive feel to it that lets you know the game is well beyond the point of pulling its punches, yet Sector 7 opts for a different mood, letting you know your hard-earned ending is just around the corner. Now, being the kind of experience that it is, Jumper is not without its flaws. Though I certainly give Mr. Thorson a lot of credit for creating a good platformer without needing to introduce action elements to liven things up, I can envision newcomers being put off by the lack of variety present in the gameplay. Indeed, there’s nothing in the way of a fallback plan if you’re not won over by the platforming challenges the game offers. The other major issue with the game concerns its physics engine. It’s not a bad engine by any means, but you do have to get used to the fact that Ogmo tends to stop more or less on a dime as soon as you release the arrow key. Unlike famous platforming protagonists such as Mario or Donkey Kong, he doesn’t exactly gain momentum. Considering that most of the game involves jumping and falling in precise ways, it’s easy to see why this would be a problem. It can be overcome with enough practice, but you likely will ask yourself if it’s worth the investment if it doesn’t click. While I feel Mr. Thorson has accomplished greater things since the release of Jumper, his first fully realized effort helped blaze a trail for his peers. He took inspiration from the games he enjoyed as a kid, set out to make what he wanted, and succeeded in his goals. The result is a game with the kind of focus you didn’t really see in independently produced titles at the time. Before 2004, you would be lucky if the game in question didn’t come across as an elaborate tech demo. While Jumper is doubtlessly simplistic, by no means does it feel incomplete. Even in light of its shortcomings, I have a lot of respect for Jumper. At age sixteen, Mr. Thorson made a game that manages to keep pace with and even outshine many AAA efforts. Its simplistic gameplay is incredibly addictive if you give it a chance. I also give Mr. Thorson credit for making a challenging game without resorting to using the brand of artificial difficulty plaguing many older titles. Should you choose to download it for yourself, you can take comfort in how his game presents a challenge that, while frustrating at times, never feels unfair. However, by that same token, I also feel this is not a game I would use to introduce newcomers to the genre. For better or worse, Jumper was a game made for platforming fans and while it would certainly give them what they want, those on the fence will likely walk away underwhelmed. The lawyer part of me wonders how Thorson got away with putting music from other games into his game, even if they were his own covers. Maybe he got licenses, or maybe they just didn’t care. There was one site I forget the name of that had MIDI covers of video game tunes, and he pulled them from there. I think he got away with it because his game was freeware. He ended up remaking the game a year or so later, and replaced some of the licensed music with original music (other tracks were just remixes of the licensed music). I haven’t played Jumper, but when you talk about physics engine, I’m betting I know pretty much how this game’s works. I feel like most of the early oughts indie platformers seemed to wind up with largely the same physics engine. Big jumps, fast ups and downs, really jerky sense of momentum, even though all these games were developed independently, they still seemed to end up in the same places. Definitely a workable system, just one that takes some getting accustomed to. Granted, I’ve not seen any gameplay of Jumper, but it looks like it falls into that same place, judging by the visuals. 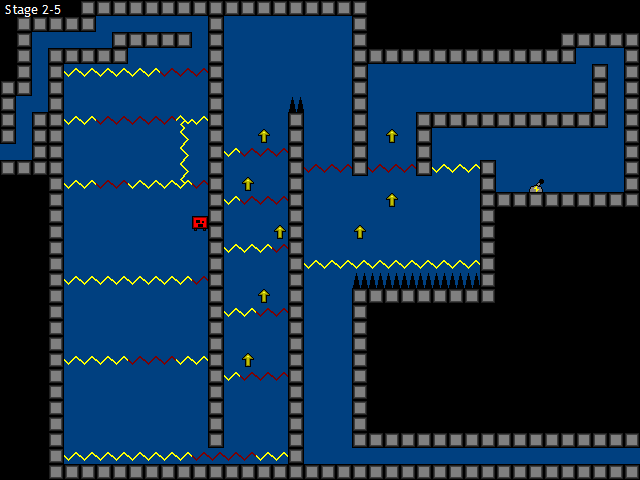 Jumper does feel less floaty than Cave Story, though I believe that latter was made from scratch. I wonder if that’s just how GameMaker worked back then? Otherwise, you’re right; that description of Jumper’s physics engine is spot-on. It’s not terrible, but it does take a bit of practice to master. There did seem to be a surplus of these kinds of games when the independent scene was taking off; a lot of these developers knew each other, so it does lead me to believe that they were influenced by each other as well. I have so much respect with Matt Thorson. Yeah, His Jumper might be a simple freeware platformer but it’s one helluva masterpiece. That game alone impressed me and many platformer fans. Thorson is also the mastermind behind Towerfall and Celeste, another two awesome games. A huge thumbs up to Mr. Overmars also for his Game Maker. Thorson sure owes him. Thanks for the nice post Red Metal! Indeed, even at the age of sixteen, the guy had a lot of potential. It’s great he was able to grasp it in the coming years and create something as unique as Celeste, though I’ve heard a lot of good things about An Untitled Story as well. Thanks for reading!